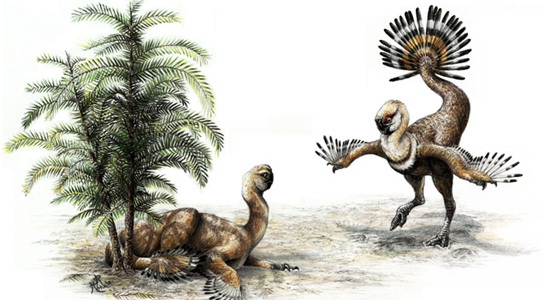 A new study indicates that a group of bipedal dinosaurs, known as oviraptors, shook their feather-adorned tails to gain attention during their courtship rituals. The scientists published their findings in the journal Acta Palaeontologica Polonica¹. The key evidence is the structure of their relatively stubby tail, which was muscular and flexible at its base, but rigid at its tip, were the half-dozen vertebrae that are either fused together into a blade-like structure or tightly arranged so that they’re inflexible. There’s no indication that the dinosaur’s muscular tails were adorned with structures that would enable them to use these as weapons. However, there is some fossil evidence of early members of the group, which lived 150 million years ago, during the Jurassic Period, that included large feathers which were either attached to the last few tail vertebrae or preserved in their vicinity. This suggests the presence of a fan-shaped display at the end of the appendage. new study of later species in the same lineage reveals that these dinosaurs had the same arrangement of tail vertebrae, and used the muscles to control he movements. None of the more recent fossils of oviraptors included feathers, but these tissues could be missing because they weren’t preserved in the fossil record or because they weren’t present to begin with. The most likely use for a feather-tipped tail is for courtship display. 1 Comment on "Stubby-Tailed Oviraptors Had Tails for Courtship Displays"
If modern day’s chicken is a descendant of dinosaur, so is the peacock whose beautiful tails are also meant for courtship. For lion it is the mane of male and for peacock it is the ornamental feathers of male. Promiscuity is the trait of males in the courtship behavior so that they can compete with other males to win their pair. This evolution is seen even 150 million years ago in dinosaurs and it is no surprising. Thank You.